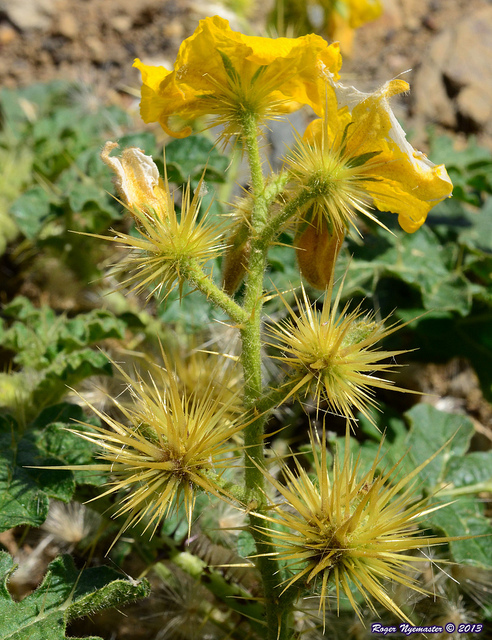 Buffalobur is generally considered a nuisance in its native range and is toxic to livestock. It is very aggressive in pastures and rangeland, competing with forage plants. Burs can get caught on sheep wool devaluing the wool. General Description: This annual plant is spiny, hairy and around 1/2 to 3 feet tall. The entire plant, except the petals, is covered by straight yellow spines that are 1/8 to 1/2 inch long. Flower Description: Flowers in clusters (racemes) of 3 to 15. Flowers are yellow, 5-lobed, flat and circular (rotate) and around 1 inch in diameter. Leaf Description: The leaves are alternate, 2 to 6 inches long, irregularly cut into 5 to 7 lobes, and extremely prickly. Stem Description: Upper stems are branching, upright, bushy, 1/2 to 3 feet long, and extremely prickly. Fruit/Seed Description: Fruit is a berry.